It is spring after all. The sun might be missing from some of our skies, the gardens are though starting providing us a fresh bounty of aromatic fruits and vegetables. In rainy days like this one, a perfect dinner relies on the suited person to share the food with you, dim lights a nice bottle of bubbly and some soothing music on the background that will company the melancholic sounds of rain drops hitting the windows, the balcony, the ponds. The moon will soon shine and all the warmth we need is already here with us. A lazy gaze to each other, tales of everyday life, challenges and satisfactions; what's missing from this picture? Strawberries, of course! Those plump, luscious, fiery drops of sunlight trapped in sweet and tangy flesh with the tiny seeds of life sprinkled over the surface. As main course in such a slow paced evening, I propose you my Chicken scaloppini in pomegranate and strawberry reduction sauce companied by a Tangy strawberries salad with fresh sage. When I first tasted this dish I was very pleased by its complexity and at the same time lightness on the palate. The chicken scaloppini bring the major texture to the bite, their starchy coating is now creamy thanks to the wine that provides the major acidity to the dish (salad aside). A hint of garlic comes up to your nose giving the dish a homey feeling. The dark red sauce provides astringency, sweetness and the complex round aromas of strawberry and sage. I perceived this dish as quite elegant and light; indeed a dish well suited for a tête-à-tête dinner with your sweet half. An elegant but homey dish that will let you loosen up in the moment. 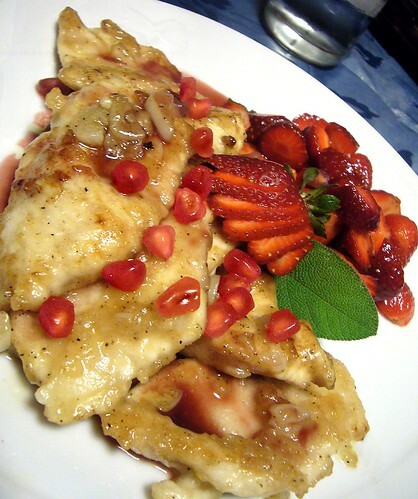 We need to start with the pomegranate, the scaloppini will cook in a matter of minutes if the chicken is sliced thinly. To seed the pomegranates, open them up using a fork by piercing them with its tines and using it as a lever to break the fruit in chunks. To seed each chunk, take a bowl and hold each chunk, seed side down, in your hand with your fingers slightly opened. Using a sturdy wooden spoon or spatula, bang the piece of pomegranate on its skin; releasing this way the seeds into the bowl. We will need the juice from these pomegranate, to do this you might use a potato ricer or a food mill to press the seeds. Keep few grains of pomegranate as garnish. In a small sauce pan, bring the pomegranate juice to a simmer and let it reduce of about two thirds or until syrupy; this should take around 15 minutes. Toward the end of the reduction process, drop in the black peppercorns. When ready, switch off the flame and drop the sage leaves and the sliced strawberries into the hot reduction. Cover and let sauce steep for 10-15 minutes. In the meantime prepare the scaloppini. Drench the slices of chicken breasts in the flour and pat any excess flour out of them. In a pan, warm up the butter with a little bit of olive oil and when warmed enough cook the scaloppini letting them brown nicely. At this point drop in the sliced garlic and let it cook slightly; sprinkle them with some salt, add the white wine and let it evaporate on high flame. Your scaloppini are about ready, sprinkle them with some black pepper, cover and keep them warm while you finish the sauce. Using a fine mesh sieve, strain the pomegranate reduction pressing down all the solids pushing the strawberries through the sieve. Taste the sauce, add some sugar if necessary, salt and pepper. Prepare some cornstarch slurry by melting 1 tsp of starch in a little bit of cold water. Bring the sauce back to a simmer and thicken with the cornstarch slurry adding it little at a time. 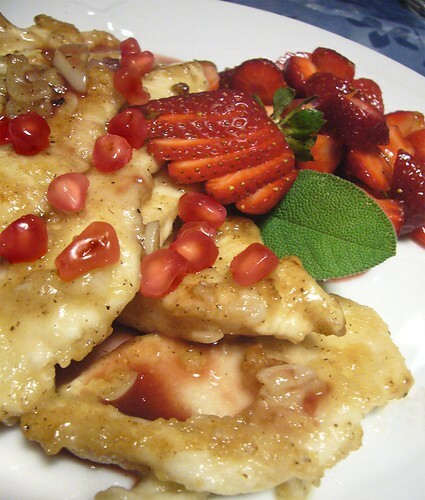 To serve, lay the chicken scaloppini on the serving dishes, coat with the sauce and decorate with few pomegranate seeds and a fanned strawberry. How to fan a strawberry? It is simple; leaving the top leaves on the berry cut the strawberry in slices taking care not to go all the way through to separate them. Gently press the strawberry down against the cuts to separate the slices creating this way a nice fan. This dish let itself to be perfectly accompanied by a fresh strawberries salad like this one. Wash the strawberries and then take the top leaves out of them. Cut the berries in little chunks on a bias. Sprinkle with a little salt, pepper; add then the lemon juice, the lemon rind and the sage. Stir and let marinate for 10 minutes before serving. Yum, can I be your sweet half? My hubby hates fruit with meat, how bizarre. But I love all fruit, and would eat it at every meal. This sounds liek a delicious evening in the making. 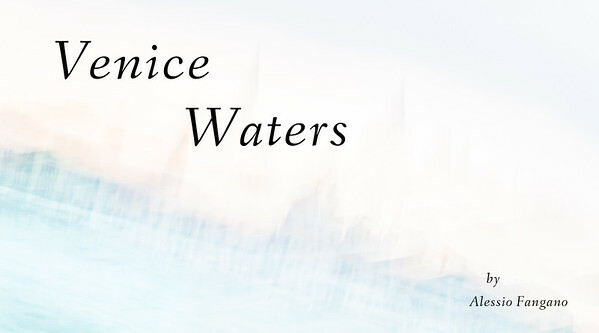 Love the way you wrote this my dear... it's calling my name! I love the complexity of flavours; so Spring and so FUN!